There are some seriously luxe new hotels opening in Dubai over the next few months, and now we’ve got another to look forward to with the news that Grand Plaza Movenpick Media City will open its doors this March. The first five star hotel in Media City is located on the edge of Media City and Internet City, and will boast 235 guest rooms, a convention centre complete with ballroom for 800 and five restaurants and bars. Upon arrival, guests will be greeted by The Swoop – a chandelier comprising of 3,500 hand-blown crystals in the centre, inspired by the flight of a bird. We’re most looking forward to European brasserie Verve Bar & Brasserie, which promises some top internationally-influenced dishes for lunch and dinner. Elsewhere, the hotel will have TWENTY THREE, a stunning new rooftop bar with panoramic urban views, poolside dining at Bytes, The Grand Lounge and a neighbourhood deli, Slice. It’s closeness to Media City also means there’s a strong business focus at the hotel, with a Convention Centre on site complete with a 600 square metre ballroom and nine meeting rooms of varying sizes. Other facilities in the hotel include an expansive health club spanning the fourth floor and comprising an outdoor pool, gym, sauna and steam rooms and SensAsia spa. 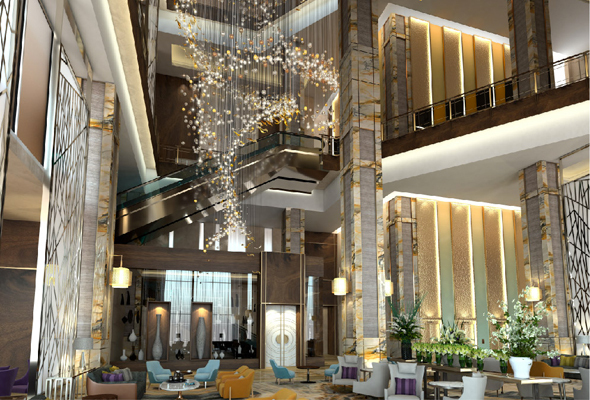 Grand Plaza Movenpick Media City is the latest in a string of soon-to-open hotels recently announced which include the arrival of W – Dubai The Palm this weekend, as well as Mandarin Oriental Jumeira, Dubai and Waldorf Astoria DIFC, which will both open in April.